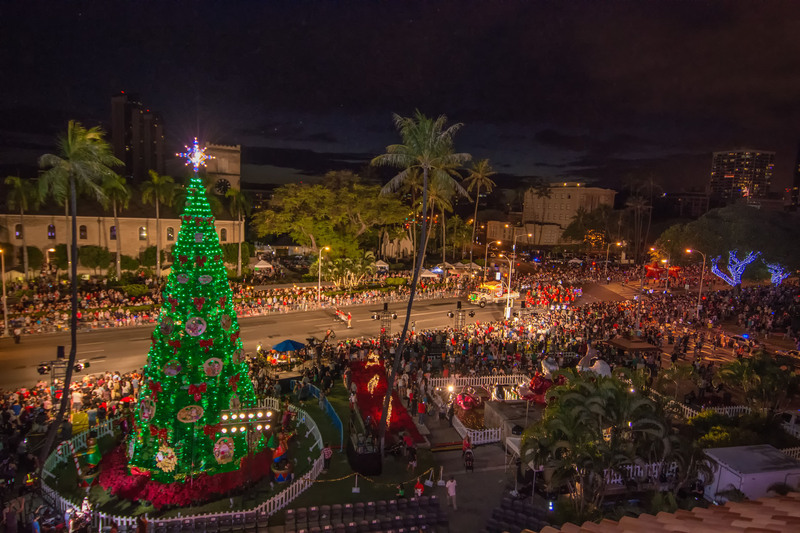 Honolulu City Lights opens on the first Saturday of December with the lighting of Honolulu’s 50-foot tree. 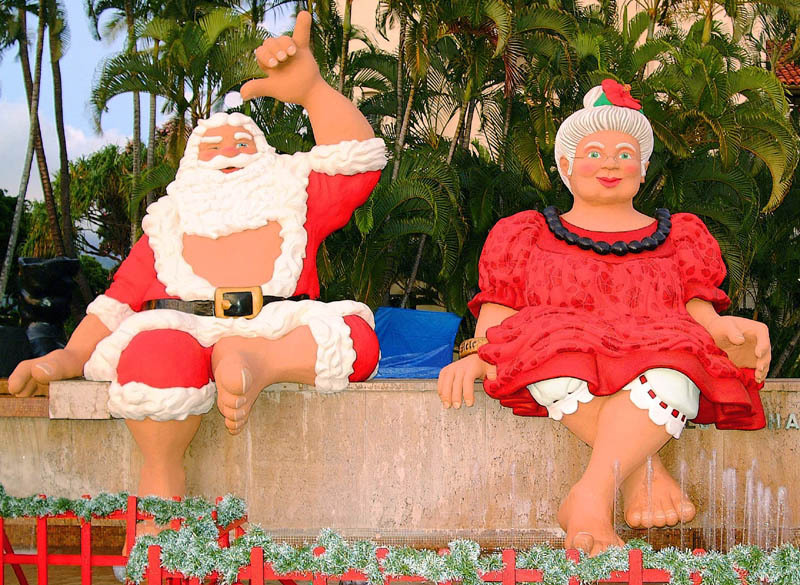 The opening night celebration at Honolulu Hale kicks off a monthlong holiday display of trees, wreaths, lights and oversize sculptures, including the famous Shaka Santa lounging with Tūtū Mele by the fountain in front of City Hall. In addition to the tree lighting ceremony, the evening is highlighted with the Public Workers’ Electric Light Parade and a free, star-studded holiday concert on the grounds of the Frank F. Fasi Civic Center. New this year is the Honolulu City Lights block party, featuring more than a dozen food booths located along the Diamond Head-side of Punchbowl Street. The 50-plus unit Public Workers’ Electric Light Parade showcases fire, police and emergency vehicles, refuse, huge maintenance trucks, buses and other city vehicles adorned with thousands of lights and festive decorations. The parade also features corporate sponsor floats and vehicles, and the holiday sounds of marching bands. See parade route and traffic advisory. Monday, December 17 at 4 p.m.
Monday, December 24 at 10:30 p.m.
Tuesday, December 25 at 3:30 p.m. Throughout the month of December, themed displays and lights will adorn the grounds surrounding Honolulu Hale, and the courtyard will feature the beautiful city tree and community wreath exhibits. Honolulu City Lights will be open daily from 8 a.m. to 11 p.m., and will run through January 1, 2019, including the Christmas and New Year’s holidays. For additional family-friendly activities, view Frequently Asked Questions. Event parking is at the Fasi Municipal Building Parking at the corner of Beretania and Alapai Streets. This lot fills quickly on opening night. If you wish to see only the parade on opening night, there are parking lots and restaurants in the Chinatown area. However, you will need to park before the street closures take place for the parade and traffic becomes heavy. After the parade, you may have to wait for the streets to re-open to exit certain lots. Honolulu City Lights is presented for everyone to enjoy by the City and County of Honolulu and The Friends of Honolulu City Lights. For official Honolulu City Lights ornaments visit the Friends of Honolulu City Lights website .